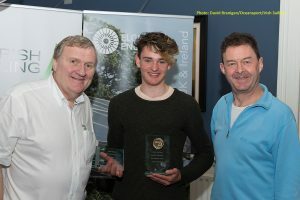 The Volvo Irish Sailing Youth Pathway National Championships were held last weekend in Dun Laoghaire jointly hosted by the Royal St. George YC and the National Yacht Club. Over 200 competitors in 190+ boats raced over 3 days (racing was abandoned on Friday due to heavy weather). 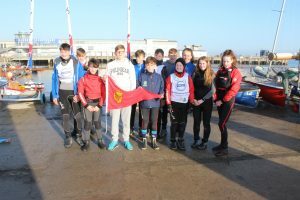 The Championships were raced over three courses, the Laser 4.7 and Toppers shared one course, the Laser Radial and 420 fleets competed on a separate course with the Optimist Trials making up the third course. The 4.7 Fleet was won by Royal Cork’s Atlee Kohl with Alana Coakley (RStGYC) 2nd and Cathal O’Regan 3rd. Our remaining 9 sailors all finished in the top 20 – Conor Horgan, Jack O’Sullivan, Ellie Cunnane, Rob Keal, Killian O’Regan, Diarmaid Desmond, Kate Fahy, Stephen Cunnane and Dawson Kohl. Conor and Ellie will also now be competing at the Laser 4.7 Worlds in Poland this July. 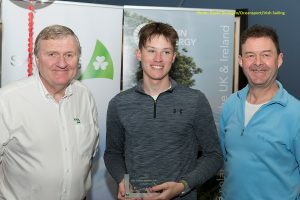 Jack Roy, President of Irish Sailing (left) with David Thomas, Managing Director of Volvo Car Ireland with Atlee Kohl from the Royal Cork Yacht Club, winner of the Laser 4.7 class. In the Topper fleet In spite of challenging weather conditions the race committee did an excellent job and completed three races on Saturday. The RCYC sailors had a good first day and the final standings that evening were very tight with Royal Cork’s David Jones leading the fleet overall. An early start on the Sunday allowed three more races to be completed and after a thrilling two days David Jones triumphed to win the event after a very consistent performance throughout. Cillian Foster finishing 4th, Neil O’Leary 5th, Ciaran Ryan 6th, Dorothy Mathews 7th (KYC/RCYC) and Hugh Lynch finishing 9th rounding out a total of 6 RCYC sailors in the top ten. A special mention to all those that took part in their very first Topper event. Jack Roy, President of Irish Sailing (left) with David Thomas, Managing Director of Volvo Car Ireland with David Jones of the Royal Cork Yacht Club, winner of the Topper class. The 420’s started on Thursday with fresh Southerly breeze. 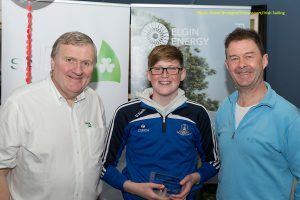 The first race was won by Micheal O’Suilleabhain and Mikey Carroll in testing conditions, with Gemma McDowell and Emma Gallagher in second place. The two boy’s suffered gear failure in the second race of the day and were unable to finish and the race eventually won by Gemma and Emma. Friday proved too windy for all fleets and no racing took place. Saturday and Sunday saw very light conditions and the Ferguson girls proved to be very strong in the light conditions and took the overall title with Gemma and Emma in second place.Micheal and Mikey took third place and first boys.